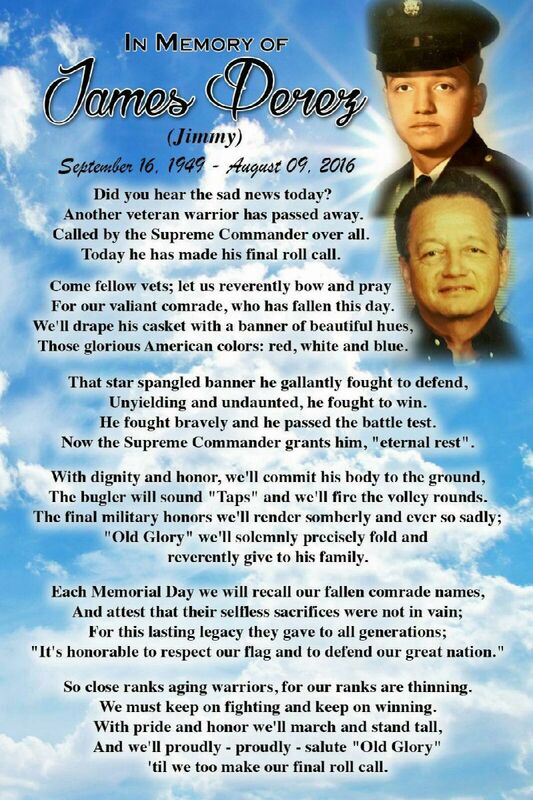 James Perez obituary. Carnes Funeral Home. 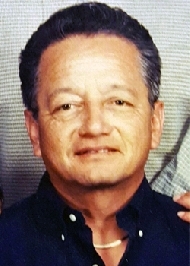 James Perez Sr. was born in Alvin, Texas on September 16, 1949 to Mary Sanchez Perez and Phillip Cruz Perez. He lived in Texas City, Texas, worked at Amoco Oil as a Millwright and retired after twenty-two years. James served his country in the United States Army in the 82nd Engineering Company USARV. He loved spending time with family and friends, loved to take rides to the dike and the fishing spot. Jimmy loved being with his son’s every time they were in town. Jimmy was a man that would help anyone in need. James is preceded in death by his parents, Phillip Cruz Perez and Mary Sanchez Perez and sister, Mary Lou Fuentes. James is survived by his sons, James Perez Jr, Adrian Perez and Eric Perez; daughter, Erin Perez; daughter-in-law’s, Amanda and Emily Perez; grandkids, Carissa and Anthony Perez, Alex (Big Al), Adrian and Gabriella Perez; great-grand kids, Jayla and Kaylia; sisters, Hope Martinez and Jeanna Ynigez ,and brother, Raymond Martinez. Serving as Pallbearers are Anthony Perez, Danny Price, Mike Aguilar, Stephen Gonzales, Roland Perez, Rudy Bocanegra, Adrian Perez and Alex Hernandez. Honorary Pallbearers are Manuel Rodriguez, Sergio Gonzalez, Alex Almendarez and Chris Hernandez. Guests are invited to share in a 5-7:00 pm Celebration of Life Visitation on Friday night, August 12, 2016 at Carnes Funeral Home-Texas City. Services will follow a short visitation on Saturday from 9:00 - 10:00 a.m., with 10:00 a.m. Funeral Services at Carnes Funeral Home – Texas City 3100 Gulf Freeway, Texas 77591. Interment will take place at Galveston Memorial Park in Hitchcock , Texas.